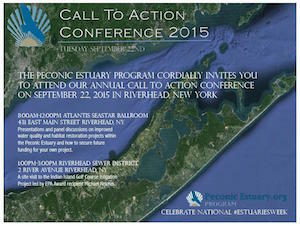 Next week is National Estuaries Week, and the Peconic Estuary Program is celebrating by holding a conference next Tuesday, Sept. 22, at the Atlantis Sea Star Ballroom at the Long Island Aquarium in Riverhead. The free day-long conference, titled “a call to action,” will include a discussion of community water quality projects with Group for the East End President Bob DeLuca, a tour and discussion of the innovative Riverhead Sewer District irrigation project at the Indian Island Golf Course and a panel discussion between the East End’s town supervisors on water quality issues, moderated by State Assemblyman Fred Thiele. The conference, which runs from 8:30 a.m. to 2 p.m., is free and open to the general public, but meals and transportation to the golf course are the responsibility of the individual attendee. The Peconic Estuary program is also holding a month-long photo contest in September. They’re looking for photos of the estuary, critters that live there or other relevant photos. A grand prize will be given in October. Beginning Sept.1, anyone can submit their photos through PEP’s Facebook page or at peptalk@peconicestuary.org, along with your mailing address.